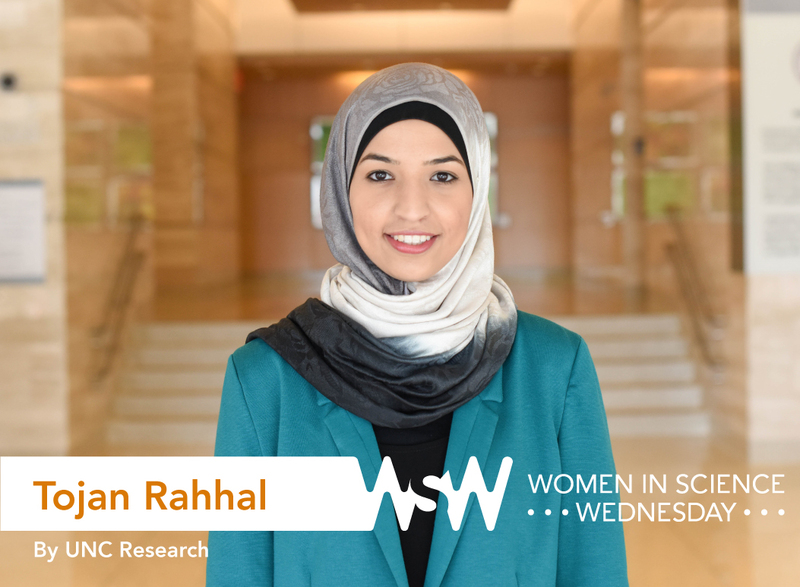 Tojan Rahhal is a fourth-year PhD student studying pharmaceutical sciences in the UNC Eshelman School of Pharmacy. Under the guidance of Joseph DeSimone, her research focuses on the delivery of therapeutics to the lungs. She is also the chair of UNC’s Women in Science group. I wanted to be everything! First, I wanted to be a lawyer — I talked a lot and still do, and could always talk my way out of getting in trouble with my parents. In middle school, I fell in love with baking and cooking and wanted to go to culinary school. 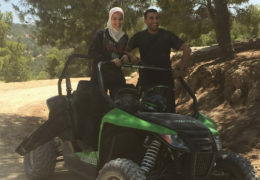 By high school, I decided I wanted to be an engineer and a doctor. Eventually, my answer was that I would go to school forever and be a “lawyer-chef-doctor.” Now, I’m an engineer and scientist, and I can also bake on the side. So maybe law school is next? I realized that all the fields I was interested in use the scientific process in some shape or form, and that is what attracted me to them. I enjoy investigating — whether it’s an ingredient for baking, or how to create a new assay to test my samples. I love the problem-solving aspect and the (sometimes) systematic approach to addressing challenges. When I started in a lab at NC State during undergrad (I am a not-so-secret wolfpacker) and wanted to skip class to do an experiment, I realized that a PhD had to be a part of my plans. Photo courtesy of Tojan Rahhal. 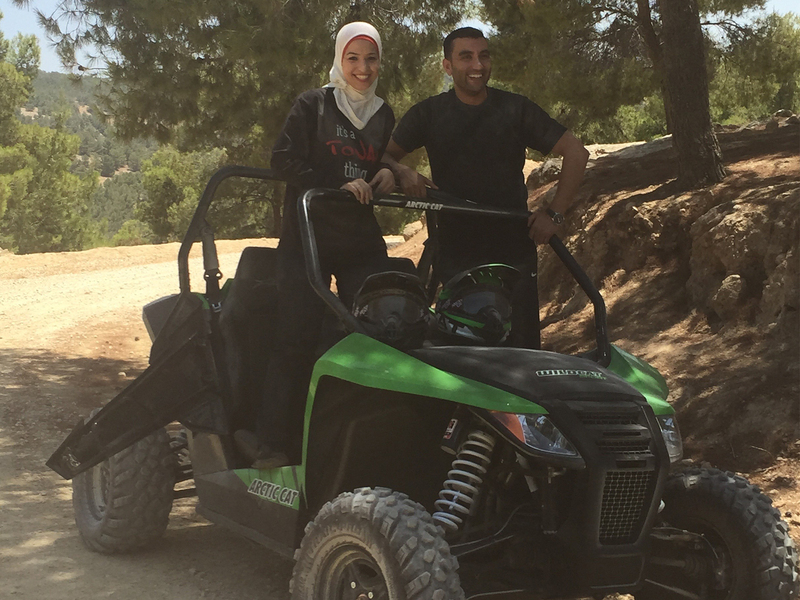 Rahhal and her fiancé ride ATVs — a favorite childhood pastime — during a trip to Jordan in the Middle East. The couple will marry this summer. What’s the funniest thing that happened while you were doing research? Once, during my third year of grad school, I was working on a very time-sensitive animal study. While working with the mice in our lab, in the middle of it all, the fire alarm goes off! We had no idea what to do or if one of us should stay in the room and continue — we had to just stop and leave, but we rushed back inside to continue and then another alarm went off. At this point, we just kept working. The first one was an issue with the building alarm, so we figured this one was, too. Luckily, we were right. Disclaimer: I do not advise anyone to do the same. “Become comfortable being uncomfortable.” That is my favorite piece of advice in terms of surrounding yourself with those whom you can relate to, as well as those who are different than you (culturally and academically). I want to add that, even though it seems like you have a lot going on, try to get involved in the community. There are great clubs and organizations doing amazing things! Organizations like Science in the Stacks do local science outreach at the library every month, and the Women in Science group hosts about four events a year including an annual symposium. These are only two of the many things I really enjoyed throughout graduate school. It is great for building your disciplinary network — you never know when you will need help with a new technique that only chemists understand!